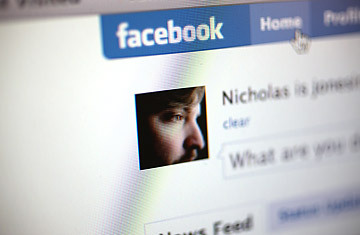 Does Facebook Replace Face Time or Enhance It? Jenny has not returned my calls in roughly a year. She has, however, sent me a poinsettia, poked me and placed a gift beneath my Christmas tree. She's done all this virtually, courtesy of Facebook, the social-networking site on which users create profiles, gather "friends" and join common-interest groups, not to mention send digital gifts. Although Jenny has three children, ages 4 to 14, and rarely finds time for visits, phone calls or even e-mail, the full-time mom in upstate New York regularly updates her status on Facebook ("Jenny is fixing a birthday dinner," "Jenny took the kids sledding") and uploads photos (her son in the school play). After 24 years, our friendship is now relegated to the online world, filtered through Facebook. Call it Facebook Recluse Syndrome  and Jenny is far from the site's only social hermit. Retreating behind a digital veil started long before the Internet existed, with the advent of answering machines. "People would call a phone when they knew the other person wasn't available to pick up," says Charles Steinfield, a professor at Michigan State University who co-authored a peer-reviewed study called "The Benefits of Facebook 'Friends.' " "It enabled them to convey information without forcing them to interact." Yet for many users, Facebook somehow remains distinctly personal. Although social-networking sites typically encourage connections among strangers  like on MySpace, where people converge through common interests, or online dating, where the whole point is to greet new faces  Facebook is geared toward helping people maintain existing connections. The site serves as a self-updating address book, keeping users connected no matter their geographical shifts. "There are people from my past life that I never would have tracked through 10 job changes and 20 e-mail changes," says Nicole Ellison, an assistant professor at Michigan State and lead author of the Facebook "Friends" study, which focused on undergraduate usage of the site. Facebook offers what she describes as a "seamless way of keeping in touch that doesn't involve all this work." Perhaps this is the key. Jenny's online sociability and offline silence probably has less to do with digital retreating than time management. Facebook offers e-mail, IM and photo sharing in what Neill calls the "one-stop shopping" of online interaction. "It's not surprising to me that it's replacing other forms of communication," says Steinfield. It's still surprising to me, however, this combination of Orwell and WALL-E that has humans watching one another through computer screens and socializing in quasi-isolation. Neill says Facebook has brought her closer to her already close friends, whom she has little time to see because of kids and work. "I know more about them now than I did when I was in regular contact with them," she says. I believe her. But I can't help wondering: If for some reason Facebook suddenly ceased to exist, would people like Jenny revert to phone calls or visits, or would they lose touch altogether? I probably won't find out. Instead, I gave in. Last week I sent Jenny a note  through Facebook, naturally  requesting a get-together. She accepted. When we met up, it seemed like we were closer than I had thought. I knew about Jenny's son's part in the school play, her sledding expedition and what she'd cooked for that big birthday dinner  information we would have shared if we still lived in the same neighborhood and talked regularly, the inane and intimate details that add up to life. The constant stream of data is a digital form of closeness. "A beautiful blossoming garden of information about your friends," as Neill puts it, adding, "I don't see how that can be a bad thing."